The digital technology has revolutionized many life facets just talk about business, civic (e-governance) and our daily behaviours on social media. Technology has infiltrated the most ordinary tasks that we constantly do like calling the loved ones via the whats-app platform or enrol with e-learning as a virtual student basing in your rural village while still streaming up with real-time classes that being taught a world away. As both consumers of modern technology product and same time bona fide citizens reeling for good democratic governance in the country. This is the right reason now you should emulate and encourage the stakeholders to stay abreast with the digital ecosystem. 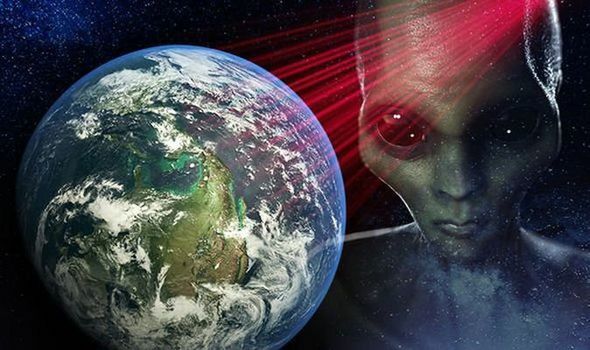 Technology today has not only touched the emotional side of human's psychology but as well as affect/perfect human psychic too in everyday alterations. Yet political landscape relatively remains untouched by technological advances. There are countries like Estonia conquering this newly available digital ecosystem and Namibia too is not a late-comer. The good news is that Namibia is ranked at #1 in whole continent par along together with developed world like the United States in the same category of political maturity and electronic voting, as according to Competence Center for Electronic Voting and Participation statistic of 2015 ] many nations remain far behind and still wary against the technology usage in a democratic setup. 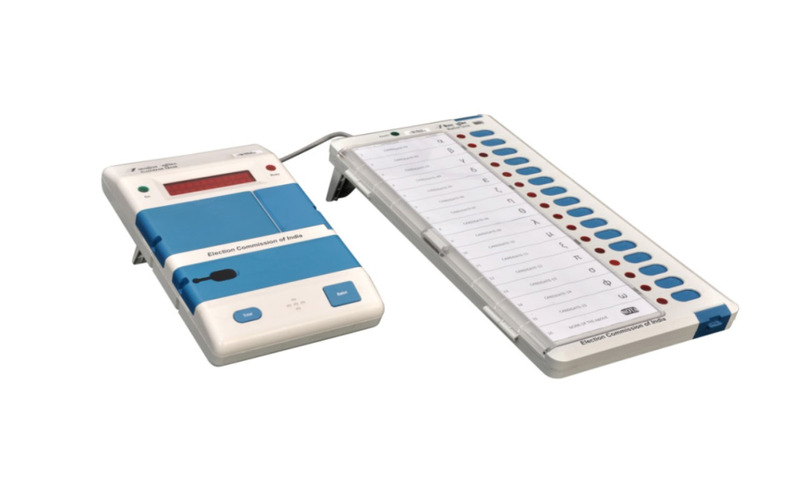 The Enterprise Volume Management System (EVMs) is a modern electronic voter machine. Namibia is the first country in Africa to use EVMs in its General Election in 2014. Governments and electorates are grappling with how to embrace the digital age and its benefits while maintaining integrity, legitimacy and ensuring infallible democracies in the world. The Atlantic Council believes that technology's forward march in the election is inevitable and its use in the voting process will accelerate. "Our role as a policy think tank is to ask how best to ensure that implementation in countries large and small to enhances accessibility, expands participation, and strengthens democracy’s credibility". People around the world increasingly rely on technology in everyday life from the ubiquity of PCs, smartphones, Internet banking and shopping, to using GPS for directions: The list is endless. Yet the process of casting a ballot stands in stark contrast, typically overshadowed by the primordial mindset of human being that uses paper ballot and pencil. People have used to this counting paper ballots even in many of the most developed nations, that hold long-standing democracies is often their election processes are done manually. We are halfway through the second decade of the twenty-first century, but yet mechanically our voting process remains largely rooted in the past. We live in a time of increasing distrust between citizens and their governments so technology can play a critical role in creating a more transparent, inclusive electoral process. To do this, technologists must reach out to key stakeholders to forge partnerships, design platform that will enhance democracy’s credibility. It is for this reason that we shall consider the issues of online election registration. There are two important queries that we shall draw our attention: What role does technology have in strengthening that? And what makes a legitimate election? The selection of a voting system in the country is one of the challenges hurdling the electoral authority. With new development today, technology has become part and parcel of communications, civic administrations, and beyond. As people increasingly use technology for a wide array of everyday functions, along with the state that seeks to increase participation, credibility, transparency, and access for all voters, governments must consider the essence of introducing technology into their democratic process. With an increasingly tech-savvy electorate, who most every person at millennia average is on social media and possesses smartphone and palmtops with internet access. Atlantic Council is an American think thank ensuring international affairs and intellectualism. Governments around the globe should keep pace with the latest cyberspace and meet electorate’s high expectations by incorporating new technology into ballot casting to improve the counting systems. The circumstances of different political environments and electorates have led some countries to seek alternatives to their traditional voting systems. In order to manage hundreds of millions of votes, India and Brazil example have increased inclusion and accessibility of polling. In fact, various countries have also turned to technology as a tool to help address these challenges. Nowadays people do just about everything online like paying their bills, making hotel reservations, applying for a new passport and file their income tax returns. Online voter registration systems supplement the traditional paper-based process, by which new voters fill out a paper form that is submitted to election officials, who confirm the registration is valid and enter the information from the paper application into the registration system. Online voter registration essentially follows the same process, but instead of filling out a paper application, the voter fills out a form via an Internet site, and that paperless form is submitted electronically to election officials. The application is reviewed electronically; if the request is confirmed to be valid, the new registration is added to the state’s voter registration list. The validation step is done by comparing the information on the online registration form against the information provided by the same individual when he or she applying driver’s license or another state-issued identification card. The signature of an individual which is already on government's record will then becomes the signature on record for the voting process. When the information does not a match, the application is sent to officials for further review or action. Sunet van Wyk giving voters' education on how EVMs works in election voting process. In technically advanced nations like Estonia, electorates use their computers, smartphones to register for the vote or change their party affiliation. The national election entity in Namibia such as Electoral Commission of Namibia (ECN) should prioritize the online voter registration process to encourage more people to sign up for a vote and improve the accuracy of voters' enrollments as well as the outcome. The online could open the door to a lot of folks and participants who have not previously registered to vote, due to unforeseen constraints like the students and expatriates who living abroad and couldn't have time to avail themselves for physical voter registration. Or some local people who may live in impassable remote villages, but have internet access on their mobile phones. 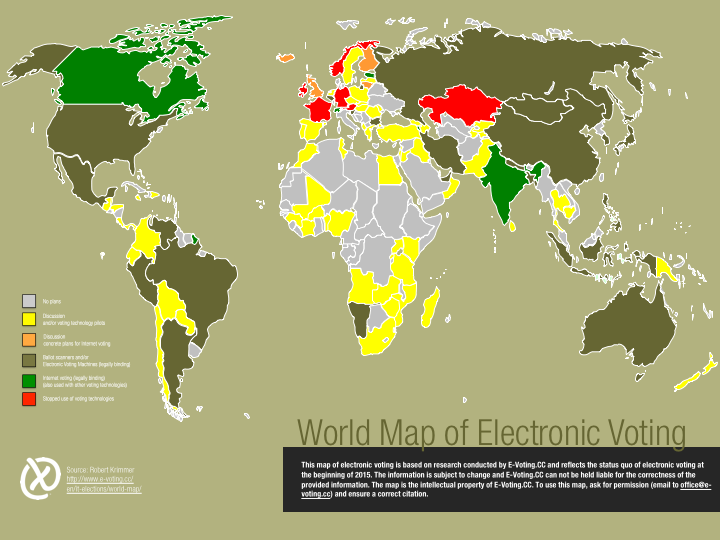 There are several countries that now using online voting system: Every Estonian citizen can vote online, which some countries being aspired to follow suit and while others remain deeply wary about. President Toomas Ilves of Estonia describing how the "E-stonia phenomena" the digital ecosystem that spread so widely in every domestic e-governance to enhances his country’s democracy in laying the groundwork for implementing online voting for national parliamentary elections a decade ago. President Ilves engaged in thoughtful discussions with industry experts; like Dr. Francis Fukuyama at Stanford University. The events brought together leaders from the policy community, election experts, and academia alongside executives from innovative technology companies, including Facebook, Twitter, and Lyft, to contrast how technology has radically changed the way society carries out daily functions and the need to bring election technology into the twenty-first century. 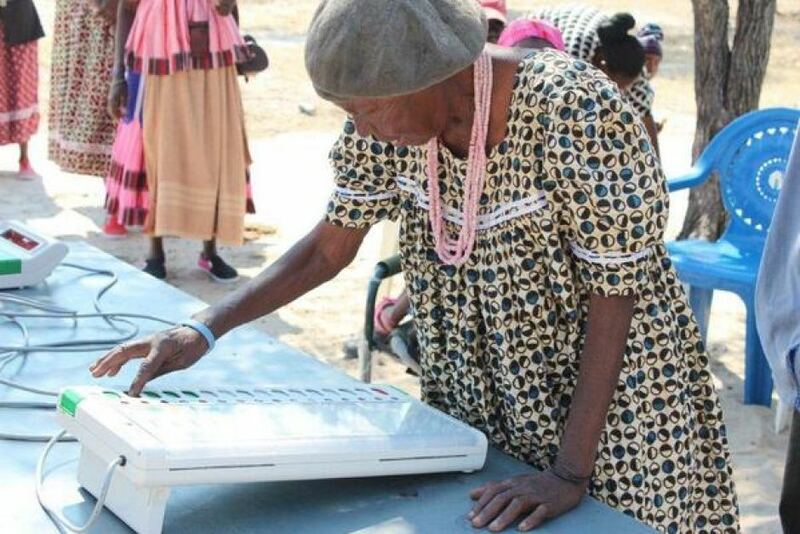 Namibian woman uses the electronic voting machine, in National Election during the first phase of introduction in the country 2014. It seems like no industry has escaped the impact of the technological revolution, yet elections remain a bit far. While some countries have incorporated the newest technologies, others still carry on with the ink and paper of past centuries. There are certain areas, such as voter registration, ballot casting and counting, which could benefit from the usage of new technologies than others: Online voter registration is more frequently available where self-registration is required. It bolstering the electoral participation especially in places which demographically underrepresented. Online voter registration is time efficiency and more accurate for voter enrollment as compared with hand-written paper forms that are often illegible and marred by data-entry errors. It is clear that trust is the cornerstone of any election result. The Namibian electoral body ECN has sole responsibility to see to it that trust is being planted into the hearts of Namibian citizens, especially the opposition political parties. There was a commotion brought forth by Workers Revolutionary Party (NUDO) and Namibian Economic Freedom Fighters (NEFF) during the 2014 national election when the ECN first introduced the EVMs in the country from India. Due to the lack of understand how the technology works among the losing political parties' members, who blamed the election mishaps on the EVMs, apparently, it caused delay in the announcement of the Presidential and National Assembly results, which they claimed results were being “cooked and manipulated behind closed doors” using the machines. Some even went on extend to said "EVMs were pre-programmed to give a pre-determined election result in favour of the ruling party (Swapo),” human-rights activist and labour consultant August Maletzky he commented on the delay in announcing the results. Will the electorates believe the outcome of an election conducted through online? And will politicians accept the outcome of such result? Growing pressure to embrace new technology that finding a suitable solution is a challenging for lawmakers and election officials. In some instances, new technology is envisioned as part of a long-range plan for improving efficiency and communication, streamlining program delivery, integrating various systems, lowering costs of operation and minimizing manpower requirements. The volatile environment surrounding most elections outcome and constant fear of rigging the result makes people wary in adopting this already-precarious boat. However, there are ways of raising the electorate's confidence by introducing electronic voting incrementally pilot projects in order to build trust, familiarity and enhances the degree of societal acceptance. All political parties, civil society, and nongovernmental organizations should partake in the decision-making process. Governments can build a wide base of support, knowledge, and enforce familiarity for these changes. Launching a robust public education and awareness campaign is another essential component to educating voters on the use of new technologies, communicating the goals and objectives for implementation, and providing public feedback mechanisms. Such efforts are particularly important in countries where public trust in government institutions is at a nadir; however, the unpopularity of government does not necessarily erode public trust in the governmental institutions that oversee elections. The integrity of electoral institutions is crucial to engendering and sustaining public trust and acceptance of electoral outcomes, and such trusted institutions should have unquestionable credibility when proposing the latest adoption of new election technologies. 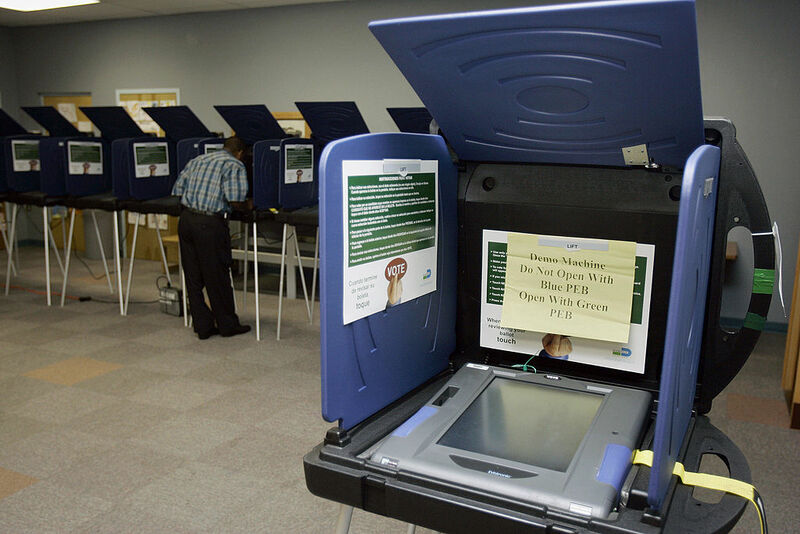 Despite an impressive list of benefits, electronic voting hasn't seen wider implementation. A speed of ballot tabulation. Accessibility for all voters, including those away from the region, those with disabilities, and multilingual considerations are all factors impacting the decision. The desire for greater electoral participation and the issue of whether or not a voting system can impact voter turnout also enter the debate. With a lack of universally accepted standards for electronic voting systems may delay the implementation. However, there is ample room for zeroing the practices and improve the concerns about fraud and ballot manipulation. The disparate experiences of political erratic countries like Kenyan election and other than who made false claims of deploying the electronic voting system, while NOT. Have led to a lack of confidence and proper consensus on the best way to conduct a legitimate, transparent electronic election. Countries have undertaken the implementation of new systems at different times, like Brazil and India motivated by the political climates and demands of the electorates. The last five years have seen a dramatic and dichotomous transformation, whereby some countries have expanded implementation, and others have reverted back to usually paper ballots.